From the bustling city streets and buildings of a vibrant 1926 New York, to Tina and Queenie’s apartment and the wonders of MACUSA, this book invites you to color your way through the adventure – even from inside Newt’s case! You will also find numerous props and artifacts inside, including wands, signs and symbols, and maybe even a fantastic beast…. The Case of Beasts delivers an enchanting interactive experience by sharing filmmaking secrets, film photography and artwork, and behind-the-scenes stories from cast and crew. Full of removable, facsimile reproductions of props and paper ephemera from the movie, along with some very special effects, this collectible volume offers a unique look from the talented group who created this movie magic. 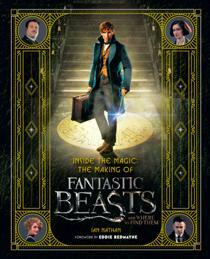 Inside the Magic: The Making of Fantastic Beasts and Where to Find Them introduces filmmaking fans to Newt Scamander, Magizoologist, and the principal characters, locations, artifacts and beasts that he encounters in 1920s New York. Explore the filmmaking magic behind MACUSA, the secretive American counterpart of the Ministry of Magic, and the magical secrets of Newt’s case. 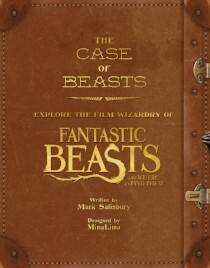 Edited by Dermot Power, concept artist on the film, this book takes you on a magical journey through a design process every bit as wonderful as that encountered by Newt Scamander in the wizarding world: from the earliest gatherings of the artists, designers and filmmakers to the magical time of the film’s production itself at Leavesden Studios. You’ll find it bursting with hundreds of production paintings, concept sketches, storyboards, blueprints and matte paintings, and filled with unique insights about the filmmaking journey from Stuart Craig and the artists themselves. 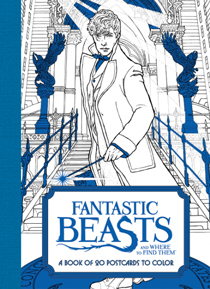 Color your way on a magical adventure as you step onto the streets of New York in 1926, and meet Newt Scamander and his beasts! 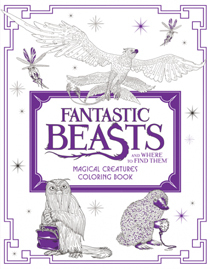 Then, unleash your creativity to add color and life to the menagerie of magical creatures that are presented in stunning black & white detail. From the Niffler to the Swooping Evil, each is waiting for you to breathe new life into them as you color your way into the wizarding world. 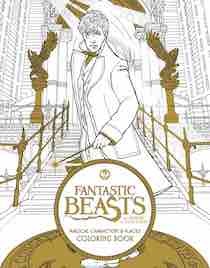 Showcasing artwork from both Fantastic Beasts and Where to Find Them: Magical Characters & Places and Fantastic Beasts and Where to Find Them: Magical Creatures Coloring Books, this collection of 20 postcards is filled with intricate illustrations and dazzling designs from the film. Ideal for coloring with markers, pencils, crayons, or paints, this book of fantastic postcards allows readers to tap into their creative spirit for hours of entertainment and fun.